I was fairly surprised by the story which went in a different direction to what I had expected, though I'm not sure it was stronger for that. From early on, it is heavily hinted that Dust was somehow involved in the genocide of the Moonbloods and that his identity is that of Cassius, General Gaius' friend and right-hand-man. This lead me to suspect that we were going to see a story of redemption where, although Casius had done wrong in the past, given a new start he makes different choices and becomes a good man. I was hoping it would address the conflict of good and bad within each person. It did… to a certain extent. What we actually got was that Dust was created by the Moonbloods by fusing two souls, that of the soldier Cassius as well as the soul of Jin, a good-hearted boy who was a resident of a village which was massacred for being Moonblood sympathisers. Dust's struggle becomes one of identity, torn between those two souls and the unique person he is now. It's a struggle where he receives little support. Most of the allied characters, perhaps aside from Fidget, seem more interest in him being Jin than him being Dust. The biggest issue for me was how the story just did not address the creation of Dust. He, a sentient character, was created as a living weapon by the Moonbloods to kill their enemies. Dust seems surprisingly okay with that and I can't recall any strong objections from many other characters in game. Creating a living weapon, using a person as a means to an end and the erasure of agency are all hallmarks of evil but it's not really addressed. In fact, the conclusion of the game follows along with the erasure of Dust's agency and him acting as the weapon he was supposed to be. This seems like a failure to me. One aspect of the story that I really did like was how it dealt with the capricious nature of the world. There was one really emotional scene where we had set out to save a sick villager by restoring water to the village. But when we get back, it's too late and he had already died. So far, nothing unusual. But the incident really hits Fidget who protests that they "did everything right" only to be told that sometimes you can do everything right but it still isn't enough. I found the lesson to be good and the way that it was handled was perfect. 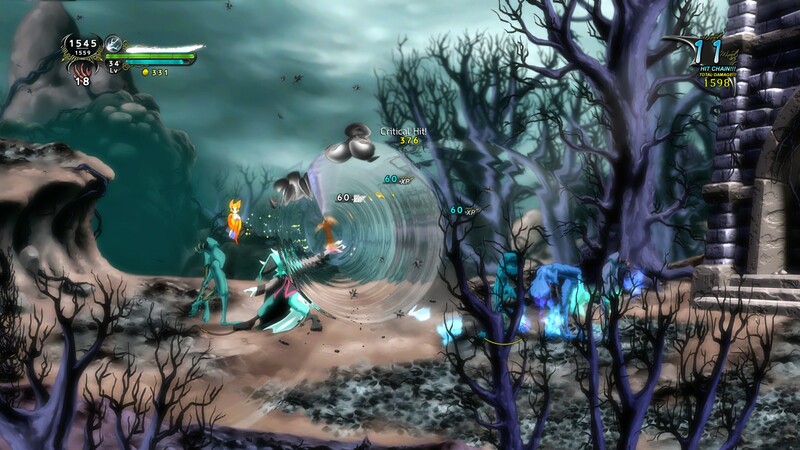 Dust is a side-scrolling action game with rapid-pace combat and an emphasis on building combos. Longer combos mean more experience with one achievement being successfully finishing a 1000 hit combo. The combat is well-executed though sometimes has a strange difficulty curve. I played through on "tough" but most average enemies didn't pose any threat at all while some presented real challenges. Particularly frustrating was the introduction of an enemy that could only be damaged by Fidget's ability. Fidget's ability has a different base damage to your normal attack and I had been keeping her attack low to help build combos. This meant combat ground to a halt for me take out those enemies, to the point where I avoided them as much as possible. There were two places where the tight controls actually failed. First was a skill where you could jump and grab vines on cliff walls. When it was necessary to jump while avoiding spikes, things became extremely difficult. Judging distance was not easy and, to make matters worse, you could only slide down but not climb up the walls. The second issue, which happened almost only in combat – and caused my death the first time that I fought the final boss – was that occasionally the game would lose focus. It would pause as I ended up on the desktop or wherever but it would throw off my timing. I don't know the exact cause of the issue. It could've been something to do with the Linux port, my window manager (Cinnamon) or that I was using dual monitors but it was a notable problem when I played. 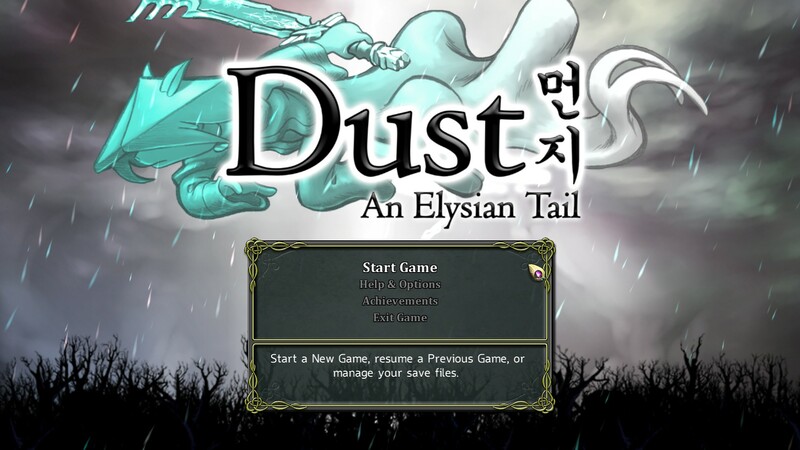 Similar to Ghost of a Tale, Dust: An Elysian Tail was primarily created by a single person. It is also beautiful to look at but Dust has much stronger core gameplay. There are a few minor weak points with the game but, overall, it does what it sets out to do and it does it well. It is an excellent game that I can highly recommend and one which is all the more impressive given it's small design team. Funny enough I had played this back in 2013... I thought I wrote a review for it... I am surprised to learn I did not. That was something I checked before writing. It had been mentioned several times, but not properly reviewed. So let me get this straight. You've taken time out of your schedule of lording over furries to play this game? Goodness, who crapped in your cornflakes this weekend? If you'd looked beyond the title and (maybe?) the byline, you'd have seen the bit in the lede about how Dust was on sale recently. Even lords have budgets. Personally, I got a copy earlier, but I got distracted by my own lordly duties halfway through. C'est la vie!